Being a coffee lover, I make sure to get my needed dose of caffeine fix once in a while. Although I have been a fan of CBTL and Starbucks, I still make it a point to try out other coffee shops every now and then. I just noticed though that the most popular cafés in the country are those which originated from foreign lands. 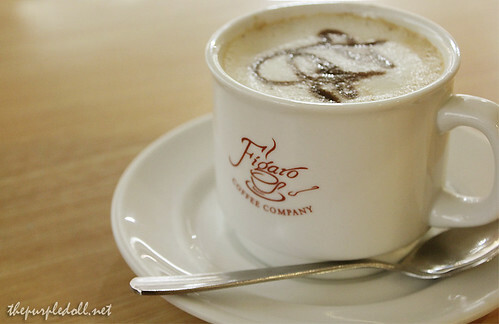 So to deviate from the usual, let me feature a Filipino-owned coffee shop this time -- Figaro Coffee Company. 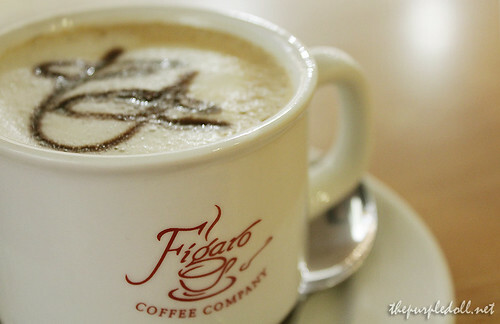 Figaro Coffee Company was established by a group of coffee enthusiasts back in 1993. From a mere kiosk in Makati, they have expanded and built café outlets all over the country. And although the name of the company is European-sounding, it definitely caters to Filipino taste buds. I have tried Figaro's offerings a few years back and was quite satisfied. However, I was even more enticed to try their new coffee and other café items when my little sis gave me a set of discount coupons as a bribe. (Yes, it's not really a gift. It's a bribe so I'd help with her video presentation.) I don't really know where and how she got it, but I'm truly grateful as this set of discount coupons is really a steal! 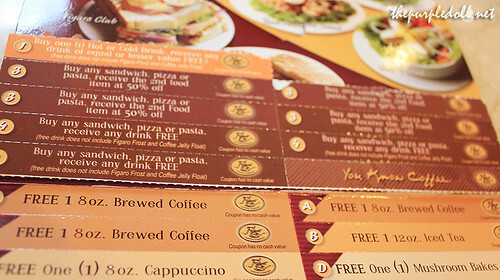 It has 3 coupons for free brewed coffee, a coupon each for free iced tea, cappuccino and mushroom bakes, about 5 coupons for buy 1 take 1 (of equal or lesser value) of hot or cold drinks, a few more for buy 1 take 1 (of equal or lesser value) of food items, and some more discounts. This booklet is just a perfect companion whenever my date and I would need to lounge at a café to kill time or just to enjoy a cup of coffee and some light snacks. So far, we have used the coupons at Figaro Coffee Company in SM Megamall and SM North Sky Garden. And luckily, transactions in both outlets were smooth and very convenient. As of date, we have tried the following Figaro drinks -- Chocolate Cookie Latte (P120), Butterscotch Vanilla Latte (P115), and White Chocolate Mocha (P115). 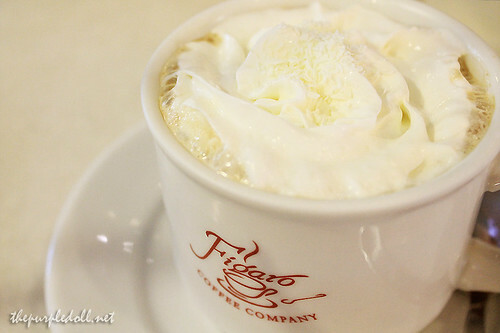 The Chocolate Cookie Latte is by far our favorite hot drink from Figaro Coffee Company. The coffee blend is rich, smooth, creamy and true to its flavor. With every sip, you can really associate the taste to a chocolate cookie. The Butterscotch Vanilla Latte on the other hand, is a slightly sweet and buttery take on a latte. Its blend is also rich, smooth and creamy. Although not as true to its butterscotch vanilla claim, you can taste hints of its flavor. Honestly I didn't really know what to expect from the White Chocolate Mocha. However, what Figaro offered was not exactly what I blurrily had in mind. I was unprepared to a bitter taste upon my first sip. Although I love strong coffee, I thought the White Chocolate Mocha would be a lighter and sweeter take. Overall, it was good though. 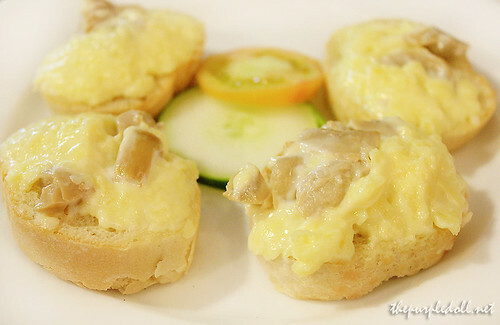 For some light snacks, we have also tried the Mushroom Bakes (P129) which we got for free. However, we were quite disappointed with this one. I am not sure if the crew served us an inferior version of their Mushroom Bakes since we are not paying anything for it. Every bite is an explosion of what tasted like Eden cheese. This dish was definitely tiring on the taste buds, and never will I order it again especially if I have to pay over a hundred bucks for something I can easily and more effectively whip up at home. 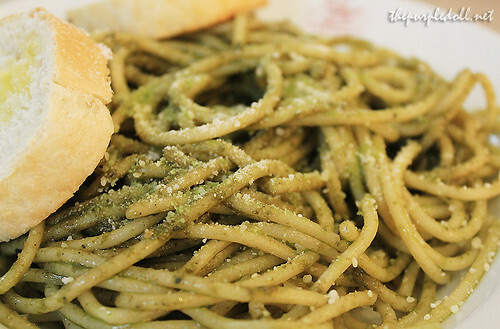 We have also tried some of their pasta offerings -- Pasta Al Tonno (P189) and Pesto (P179). 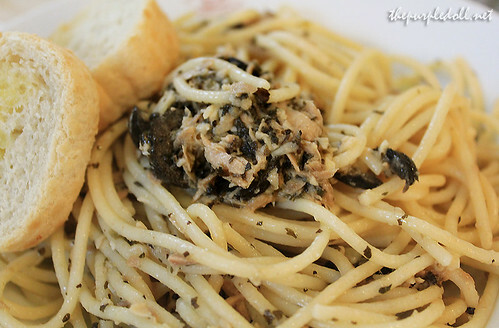 Figaro's Pasta Al Tonno makes use of spaghetti with tuna flakes, black olives and capers, slightly sauteed in olive oil. Although not as flavorful as I'd want it, it was quite good and satisfying. The pasta was cooked al dente and the ingredients created a harmonious herby, salty yet pungent flavor. The Pesto dish on the other hand, was quite memorable. Although the pasta was cooked nicely, the flavors of the pesto were not as strong as it should be. The dish also seemed to lack some salt and pepper. However, it was still palatable and quite enjoyable. 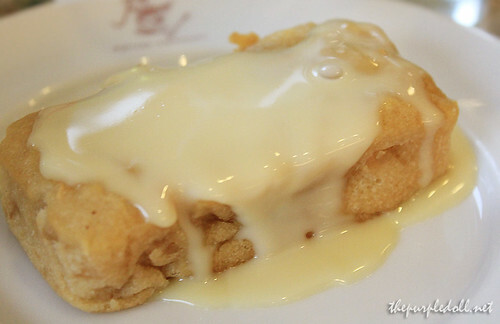 Last dish we tried was a dessert item from Figaro's glass-covered chiller -- Bread Pudding with Vanilla Sauce (P69) which was even featured at Spot.ph's 10 Must-Try Coffee Shop Desserts. True enough, Figaro's Bread Pudding with Vanilla Sauce is a lovely dessert which will remind you of homemade sweet treats. The bread pudding was soft, light and custardy. But what made it more special is the vanilla sauce which had hints of brown sugar. It was not too sweet and is definitely a great pair for hot coffee. Although Figaro missed on its Mushroom Bakes, it had a lot of hits with its great flavored coffee and unforgettable bread pudding. In all honesty, even without the discount coupons, my date and I will surely pay Figaro Coffee Company another visit to try more of their hot coffee variants and sample their famed desserts. I'll also have to try their new beverage addition, milk teas! Oh and if you're wondering, we still haven't used up all the discount coupons. Sky Garden, SM City North EDSA, North Ave.
2/F SM Megamall Bldg. A, Julia Vargas Ave. I know that card. It's from Smart Concept! They also have other partner establishments. They sell the card for P399 and you can get various discounts and freebies already. @Gellie Abogado: Give it a try! :) It's perfect for people who like their coffee a little sweet. wow the coffee look amazing! bread pudding looks good but i don't think i will visit figaro, not now because i still can't move on with my experience with them. (small spider inside my calzone). I would love to try them all...ehehhehe! I love the ambiance in Figaro, more peaceful than SB. Hi Sumi, It's sad to know about your experience about inferior version of Mushroom Bakes.Sabagay free lang naman , Pero kahit pa. Did you attempt to mention that to the staff or management? I normally talk to the manager or senior crew what they should work and improve on. That happened to me somewhre else . A large chain of coffeeshop too in one of their branches in ortigas and as a result they gave me a mug for being honest daw. Anyway ,now I am craving for Pesto.. haha. wow, your verdict is too good to be true! I love FIGARO! I like the abundant food options at Figaro, not only limited to sandwiches like other places. Gusto ko yung pasta nila! Yung niece ko fave nya ang pesto. Yun lagi kinakain. lol! Wow! Yummy food! My saliva is dripping ha ha ha! I should try the pasta! Figaro is my favorite coffee shop! :) Most of their outlets are a bit small but I love the coffee! I can't remember the last time I had coffee at Figaro. I guess it's because there are a ton of coffee shops mushrooming around the Metro. And I guess I got a little hooked to Starbucks Mocha Frap. the food pics had us craving for some coffee..and cake haha! would love to try the bread pudding with vanilla sauce! nice review, i love coffee from Starbucks and Settle's but I haven't tasted figaro coffee yet, but now, i think i should try soon! I love Figaro! Besides the fact that it supports local coffee farmers, it is just right for my taste. Starbucks give me a headache. CBTL concoctions give me stomach problems, that is why I only tell them to put 1/3 of cream topping. But then, Figaro cups are just so small! LOL! I am used to having coffee in huge mugs! Hi sweetie! I have the same set of coupons as yours. Actually 3 left na lang and will be posting about it too :) Enjoy Figaro coffee!Bought it from a salesman who went here in the office. @ Sumi.. Mushroom bake shouldn't look like that. What branch did you had this? best-sellers for the bakes are: Ham & Cheese, and Cheese-Pimiento.. I love coffee places and Figaro is totally bringing it! Didn't know it's actually a Filipino who owns it! Nice! 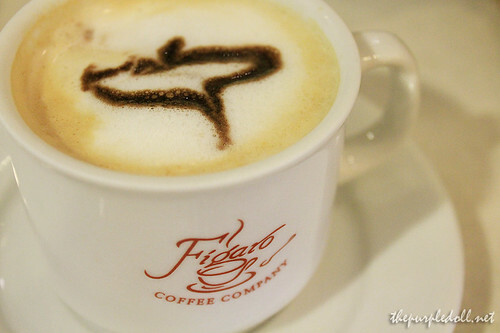 We used to drink coffee in figaro at megamall..love it.. I love figaro, I love it more than Starbucks. I love they Pasta meals.